The department invited Dr. J. Marshall Shepherd from the University of Georgia (UGA) to give a Hammond Lecture on January 30, 2014 at the Hodges Library. A reception was also provided to honor the Hammonds and Dr. Shepherd in Mary Greer Room of Hodges Library before the presentation. Dr. Shepherd is a leading international expert in the area of weather, climate, and related sciences. He is the Georgia Athletic Association Professor of Geography at the UGA and Director of the UGA Atmospheric Sciences Program. Dr. Shepherd is the current President of American Meteorological Society (AMS). 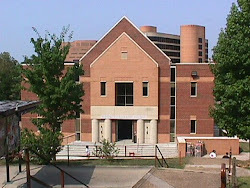 Dr. Shepherd joined the Department of Geography in January 2006. Prior to joining the UGA faculty, Dr. Shepherd spent 12 years as a research meteorologist in the Earth-Sun Division at NASA-Goddard Space Flight Center. Dr. Shepherd was also Deputy Project Scientist for the Global Precipitation Measurement (GPM) mission, which launches in 2014. He is a Full Professor conducting research and teaching in atmospheric sciences, climatology, water cycle processes and urban climate systems. Dr. Shepherd is currently a member of the NASA Precipitation Science team. For his pioneering work using satellite data to investigate urban hydroclimate processes, Dr. Shepherd received the highest federal award given to the Nation’s young scientists and engineers. President Bush honored him on May 4th 2004 at the White House with the Presidential Early Career Award (PECASE) for pioneering scientific research. Dr. Shepherd is a Fellow of the American Meteorological Society. Dr. Shepherd has also been recognized by the AMS with its Charles Anderson Award for his career contributions in the areas of diversity.